Find the last tote-bag you got for free from a conference, signing, event or those Girl Scouts at the Super Walmart when you bought six boxes of Thin Mints. Fill the bag with two hotel soaps, a crunchy granola bar if you prefer chewy (or vice versa), five pens bearing the names of businesses you can’t remember patronizing, and some sticky notes. Carry it everywhere. Switch to half a plastic cup of weirdly-tangy red wine. Even though you know you’re going to get a headache, it’s so much easier to mingle when you’ve got something in your hands. Print out the first fifty pages of your newest manuscript, just in case. Put it in your tote bag. Each time a page gets crinkled or dog-eared, drink. Using Google Images, download photos of Junot Diaz, Dinty W. Moore, Sue William Silverman, Karen Russell, Stu Dybek, Roxane Gay, Alicia Ostriker, Dani Shapiro, Arthur Sze, and anyone you can find from The Rumpus. Now, add in photos of similar-looking people that Google Images suggests. Create a slideshow with all of the photos and set the time to 1 second per photo. As the pictures flash, guess who each person is. Each time you get one right, choose a book from your pleasing display and put it in your tote bag. Each time you get one wrong, drink. Scroll through Twitter on your phone. Favorite the tweets and follow anyone using the #AWP or #AWP15 hashtag. Retweet anything that makes you smile wryly. Browse the books in your pleasing display and ask yourself of each one: Do I know this author personally? If so, why did they only sign their name and not something that says how great I am and how much they can’t wait to be beside me on the bestseller list? Each time your heart is stabbed with bitterness, drink. Retreat to the safety of your sofa and watch CNN for 20 minutes. Then head for your kitchen. Turn the lights down low. Put on some music as loud as you can stand it. Go to that YouTube video of the coffee shop sounds and put that on, too, turned all the way up. Pour yourself a full glass of wine you actually like and call a writer you met anywhere last year, on speakerphone. Drink every time one of you says, “I’m sorry, can you repeat that?” At the end of the conversation, look through your display for any journals in which that writer’s work appears and add them to your tote bag. Flee to the bathroom (leave the music on). Lock yourself in and look through the books in your tote bag. Find a poem so powerful all you can do is lean your forehead against the coolness of the wall and wish you had written it, even though you have never even contemplated making a poem in Sapphics. Leave the bathroom and go to the nearest Starbucks in a taxi. Have whatever you normally order, but a size larger and with an extra shot. Go to Brevity’s list of craft essays and read six of them. Every time you find the word “ruminate,” drink. Scan the coffee shop. Does anyone look like any of the pictures of authors you downloaded? If they do, see if you can work up an excuse to talk to them without looking like a doofus. If they refuse to start a conversation, slink away, then drink. If they chat enthusiastically but are not in fact who you thought they were, drink. If you can’t figure out how to end the conversation gracefully, drink. Eventually you can excuse yourself to pee. Go back home on foot. It will be farther than you remembered. Turn off all sounds in your home and enjoy the blissful silence and partial sobriety. Leaf through the last few books in your display and just take anything you want. Then sit down and look through everything in your tote bag, being honest with yourself about what you should keep. When you’ve decided “All of it,” start looking at the names of publishers, and writing down agents who are thanked in the Acknowledgements. One of them’s gotta be right for you, and Tuesday morning, you are totally gonna be on it. Imagine a kind-eyed flight attendant with a cart of assorted complimentary drinks. Have a ginger ale and feel virtuous. Find the poem you loved in the bathroom and read it again. Imagine the writer you love most in the world feeling that way about your work. Pass out from exhaustion. In two hours, wake up and write something right away, before you lose the magic. Allison Williams is Brevity‘s Social Media Editor. In the past ten days she edited two books, directed a show with 86 children in it, and moved to a new house. It was almost as action-packed as AWP. I love the picture and its caption, Allison! Reblogged this on The Adventures of Jane Writer. This makes me feel better about not going to AWP, and I also loved the form and detail. Thanks! This is brilliant. I might even try it! Thanks for saving me the money and angst of travel. Hilarious. This made my day. Damn. Just saw this. Bookmarking it for next year. Thanks. 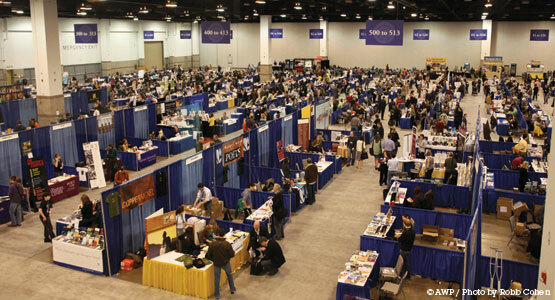 You are currently reading So You Didn’t Get to Go to AWP at BREVITY's Nonfiction Blog.